To the dwarves, the swearing of an Oath is a sacred and monumental thing. Oaths are used for the most solemn and powerful agreements: Alliances, Marriages, Debts of Honor, Vendettas and the like. The priests of Moradin are the holders of Oaths. They witness and record the Oath, casting each one into iron tablets that are affixed to the walls of the Oath-Hall of the Temple. Each end of the tablet designates one of the parties to the Oath, and the center holds the Oath itself. Multiple parties in an Oath result in multi-lobed tablets. Oaths are considered to be in force for as long as the iron tablet endures and if the tablet ever rusts or breaks it is considered a sign from Moradin. The location of the rust or break is used as an Augury in those cases - determining the actual message from the God. The Oath-Hall of the Temple also houses Honor's Stone, a rock where the Oaths are sworn. 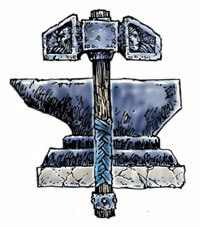 On the stone is a steel anvil and 2-handed hammer, used for the testing and passing judgement on Oaths. It is the sworn duty of all Priest of Moradin to uphold Oaths. An accused Oathbreaker is to be brought to the Oath-Hall, where they can be judged by Moradin himself. By custom, no-one is a KNOWN Oathbreaker until after Moradin has rendered judgement, but in many cases the evidence seems to speak for itself, and some are judged oathbreaker by public opinion. 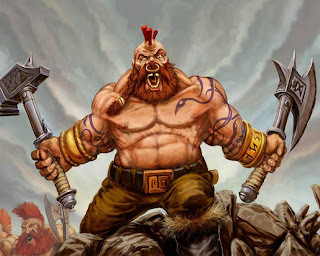 This is a grievous thing for a dwarf, but not nearly so much as being judged Oathbreaker by Moradin himself. Many Outcasts seek death in battle. Formal Judgement involves striking the tablet that represents the Oath on the anvil of Honor's Stone. The results of the blow show the Judgement of Moradin in the matter. An unharmed tablet means that Moradin considers the Oath to still be valid, while a partially or wholly destroyed tablet indicates guilt by one or both parties. A cleanly broken one indicates that Moradin considers the oath to have been fulfilled, with no fault on any particular side. A dwarf that is Judged as an Oathbreaker has two choices. He or she can be Outcast, receiving a facial tattoo that spells death if the Outcast is seen within dwarven lands. Many dwarves consider an Outcast to be fair game in any land. Otherwise, the Oathbreaker may offer formal Redress to the other parties of the Oath. Redress is some form of compensation or apology, and it’s nature is up to the Oathbreaker. The higher the Redress, the more honor is maintained by the Oathbreaker. It is up to the other party or parties to decide if they accept Redress. If they do, the Oath is considered fulfilled. If they refuse it, the Oathbreaker is Outcast. It is considered dishonorable to refuse an appropriate Redress. The life of the Oathbreaker is almost always accepted if offered as Redress, and maintains the honor of the Oathbreaker’s Clan and Hold. 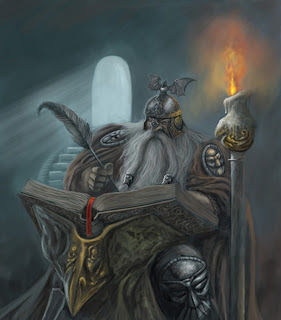 Some priests of Moradin are Oath-Keepers - the closest thing to inquisitors that the dwarves have. Oath-Keepers investigate allegations of Oath-breaking, retrieve the accused parties and interpret and administer the Judgement of Moradin. This is usually a separate process from the laws of a kingdom or hold, and takes precedence over local laws. Oath-Keepers are able to request aid and support from any dwarves that worship Moradin.